MUMBAI: Residents of Mohammad Ali Road, Dadar and perhaps even Peddar Road may suddenly develop an affinity for antique cannons. For Feng Shui expert Lillian Too has made an important pronouncement. "Flyover outside your window is no good. But you can deflect the bad energy by placing a cannon or a mirror there." said the world-famous interior decorator of sorts, who professes to change people's lives with the gelp of white dragons, waterfalls and windchimes. 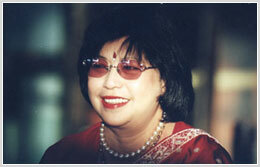 Ms Too is in Mumbai to deliver a series of lectures of Feng Shui. A mesmerised audience at the Y.B. Chavan centre listened patiently on Saturday as she spoke about how one could change one's luck by balancing the energy sources in living and work spaces. By the end of it, almost every participants - who had paid RS 2,500 for the day-long session - had his or her hand raised during the question-answer session, sceptics be damned. "Madam, how can I improve my fortunes?" "Build an auspicious water feature," she said. "If you live in a bungalow, and have the space, make it a six-level waterfall that cascades gently downwards. If you are in a flat, you can make do with an aquarium - but make sure it is not in your bedroom." "I live near two hospitals and a cemetery and there are a lot of suicide in my building. What can I do to mke my environment more salubrious?" "Tsk. Tsk. Hospital, Cemetary. No wonder there are so many suicide." You must paint a lot of red in your house to ward off the energy of the dead. Or just wear a lot of red, even red lipstick will do." .. And so forth. While rationalist would be dismayed by such superstitious - some would even say banal - discussions, Ms Too came through as a patient, kind listener who seemed to have a solution for everyone with a problem. She delivered the kind of pat responses that have made Feng Shui as popular in Mumbai as saas-bahu serials. No wonder a shop in the heart of Dadar, sells exclusively Feng Shui objects, a signboard in a Bandra slum offers "Fengsui" advice, and the babas and hakims who advertise in train compartments have added FS to their list of wares. But Ms Too was also quick to make one thing clean, a message which should keep the charlatans at bay, "Anyone who tells you Feng Shui will change everything is lying. This can only take care of one-third of your luck - your earth luck. One-third is your heaven luck, your karma, which is what you come with. And one-third is your mankind luck, what comes about as result of your actions and attitudes." Clearly, Ms Too has no shortage of heaven and mankind luck. The Harvard business school graduate had a successful corporate career as head of the Dragon Seed department chain in Hong Kong. But there was one niggling lacuna - she was childless. She had been married then years and her marriage was on the rocks. At the time, her Kung Fu teacher and friend insisted that a giant bringing them bad luck and she needed to apply Feng Shui to her life. He finally convinced her to move house, which he did, and let him make some Feng Shui changes. She conceived shortly thereafter. That was when she decided to help others through this ancient Chinese practice, which she likens to acupuncture and tai chi. Ms Too, a Buddhist, insist that Feng Shui is not a religion, but a technique which involves living with a greater awareness of one's environment and then designing and arranging things in such a way that the energies becomes harmonious. Of course, Ms Too has successfully mixed earth luck with business luck. "I am currently sitting on 45 invitations to speak at places all over the world" she said. The bestselling author from Malaysia, whose books have been translated into more than 20 languages and have crossed 3.5 million in sales, offers a daunting range of Feng Shui merchandise on her website. So, if you are trying to improve your love like, pick up her compass, buy one of her little green tigers and you may just find the chimes ringing.